The claims made in the Motion are worthy of examination. That this Assembly notes that a solution to the post-primary process has not been found. The facts prove otherwise. According to the results of a survey of parents conducted annually since AQE started offering transfer tests (1) The number of applications has grown annually, (2) the tests are more popular than the transfer tests offered by CCEA, (3) the satisfaction expressed by parents runs in the high 90% area. Further notes that a one size fits all educational solution will not work. This is stating the obvious so long as a selective education system continues. 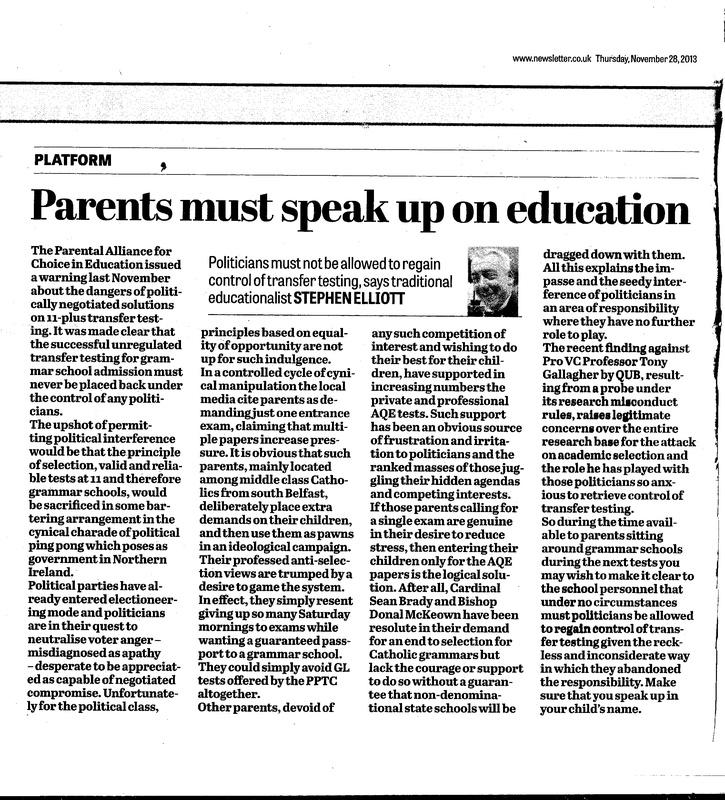 Unfortunately the persistent interference by politicians determined to impose a comprehensive system on Northern Ireland parents will ensure the imposition of a one size fits all schooling system. Did anyone in the Ulster Unionist Party actually read this prior to submitting it? The only people politicking on education are the political parties who are foolishly pandering to principals and teachers who want less accountability. Calls on the Minister of Education to convene talks with all the major stakeholders in order to build consensus and agree a way forward on the issue. Martin McGuinness’ Household Survey gave the education establishment the answer they didn’t want to hear in 2002. 64% of households in Northern Ireland wanted to retain academic selection. A cabal of unaccountable educationalists had different ideas which can be associated with Sinn Fein’s Eire Nua. The past decade and a half have been spent trying to convince parents that the education system is broken and in need of rescue. Thankfully AQE gained access to an instrument which meets all of the international standards for high-stakes tests. It is worth noting that in choosing the time to raise this matter the UUP will have been aware of the commencement of annual transfer testing in schools throughout the province. Undoubtedly the media willingly play their part in stoking up the annual faux-crisis by picking up on the politicians unobtainable target of ending academic selection or combining the two different tests into one. The UUP are deliberately ignoring young people and their parents and cynically adding to unnecessary anxieties and distractions for pupils preparing for important tests. It is noteworthy that Danny Kennedy, no longer a Minister in the Executive, has tabled this motion. 15 years ago Mr Kennedy was the Chair of the Education Committee when Martin McGuinness launched his campaign to remove selection. Now he is back in the education field readers should be reminded of his effectiveness, or lack thereof, e.g. It took The Times Higher Education https://www.timeshighereducation.com/news/phantom-book-discovered-in-queens-research-portal/2014144.article to out Professors Gallagher & Smith on their academic misconduct. While Basil McCrea and the Ulster Unionist Party seek to hold education to hostage in relation to the devolution of Policing and Justice perhaps he should take time out from appearing on the Nolan Show to address a simple demand made in a report issued in 1955. The Qualifying Examination is an easy object to criticise provided the critic is not obliged to find some substitute for it. Well Basil you have six days to sort it out. Parents are watching and waiting. 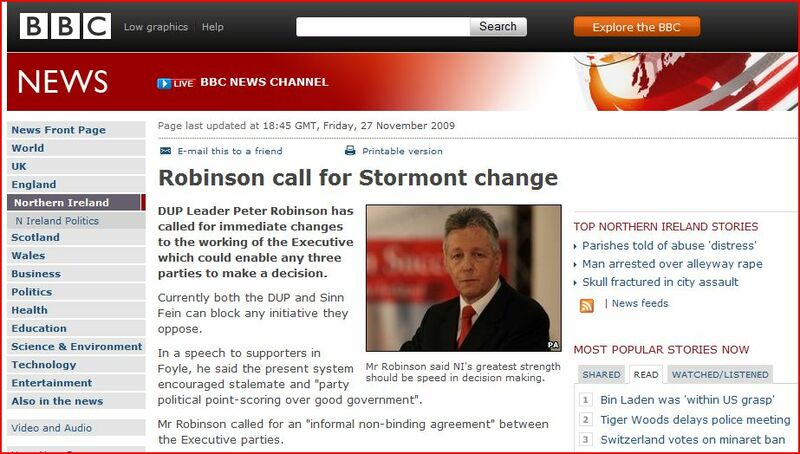 The Northern Ireland First Minister Peter Robinson, has proposed a change to the decision making process of the Stormont Executive. When applied to the blocked decision of the Education Minister to end academic selection the consequences of Robinson’s folly become apparent. Three parties represented in the current Executive, Sinn Fein, the SDLP and the Ulster Unionist/Conservative are all opposed to academic selection at 11. If Policing and Justice were devolved it would mean the Alliance Party would join the Executive and add their anti-academic selection position to the mix. 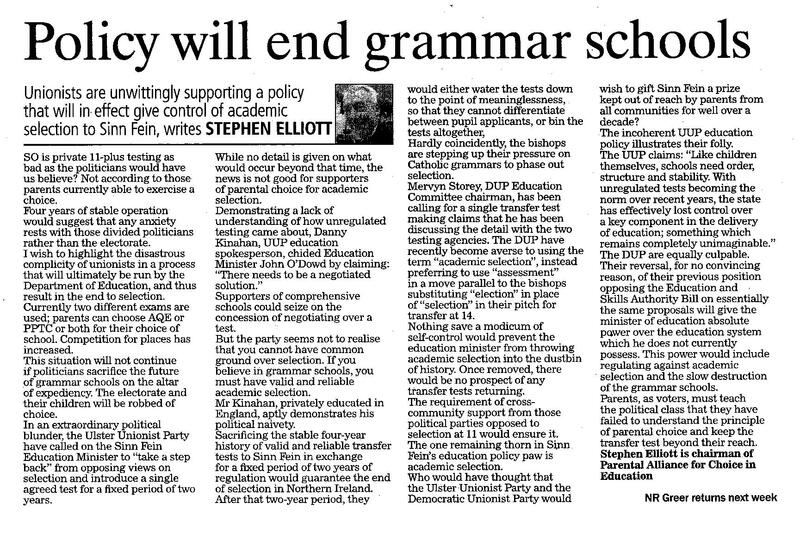 Mr Robinson’s DUP could loudly claim that the ending of academic selection at 11 was not their fault and that the decision was a positive example of the ending of “party political point-scoring over good government”. Peter Robinson, Northern Ireland First Minister and leader of the Democratic Unionist Party. Mr Robinson’s use of irony is matched only by the Education Minister’s claims to value equality. Both have now adopted the equality of result or outcome model. A Marxist system which typifies the DUP -Sinn Fein coalition. It is little wonder that parents and pupils have fallen victim to the political mismanagement of the mandatory coalition in order to preserve the greedy self-interests of a failed political system. Prior to the media announcement by the Catholic Heads Association on their position on academic selection and testing a unionist politican seems to have stolen their thunder. Jim Allister QC MEP issued a press release on his web site. The message was a warning on a political fudge by unionists on academic selection and testing that would see a retreat away from the 11-plus by accepting a test which has less validity and reliability than the current transfer test. No doubt he was alluding to the St Andrews Agreement and the votes obtained by the DUP on the subject. The letter was sent prior to the Conservative Party Confernce in Birmingham. It is remarkable that so little has been reported from Northern Ireland MLAs and MPs given that many attended the Conservative Conference and hosted fringe meetings. Has the cat got their collective tongue or are deals underway to guarantee the destruction of Northern Ireland’s academic selection system and with it grammar schools via the Tories and their Unionist friends? Parents must decide if the failed position of political and church leaders will be allowed to destroy their child’s right to a suitable education.